Have copied Blu-ray and DVD movies to MKV or M2TS format, but don’t know how to move and watch them on your new iPad 3 and iPhone 5 so that you could kill time while waiting a bus? Got plenty of AVI and WMV videos from friends but have trouble transferring to iPod Touch 5? With Pavtube iMedia Converter for Mac, you could find an easy way to convert MKV, M2TS, AVI, WMV and many other video files to iPad/iPhone/iPod Touch compatible formats and transfer the converted MP4 videos to your device via iTunes. 1. 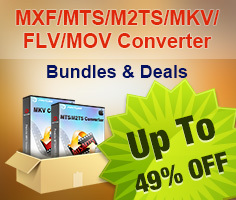 Install MKV//M2TS/AVI/WMV video converter on your Mac. You could download a free trial version of Pavtube iMedia Converter for Mac and install. Windows trial version Pavtube Video Converter Ultimate is available here. 2. Load source video in Pavtube iMedia Converter for Mac. Import your MKV//M2TS/AVI/WMV video, Pavtube iMedia Converter for Mac allows users to load more than one video as the same time. 3. Select iPad/iPhone/iPod Touch 5 compatible format. Pavtube application offers users a great choice to get the most suitable profile for your Apple iOS device, almost all generations of iPad, iPhone and iPod touch are listed here, so you would always find the one for iPad mini, new iPad 3, iPad 4, iPhone 5, iPhone 4/4S, iPod Touch 5, etc. 4. Adjust profile presets (Optional). When you are not satisfied with the default profile presets, click “Settings” button on software UI, and you could customize profile parameters in your own way. You are allowed to adjust Video Codec, resolution, Bitrate, Frame Rate... to get better video quality or adjust output video size. 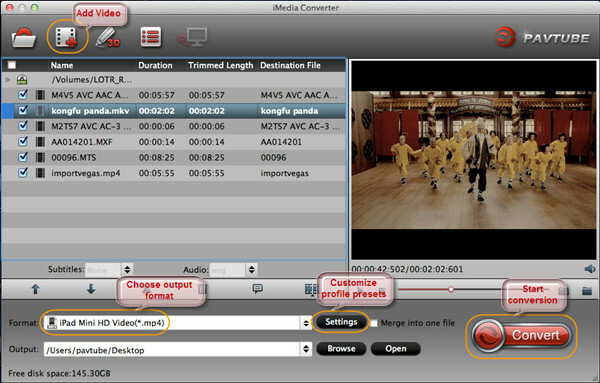 Note: you are allowed to edit the source video, including trimming, cropping, splitting, merging files using Pavtube iMedia Converter for Mac. 5. MKV/M2TS/AVI/WMV to iPad/iPhone/iPod Touch 5 conversion begins. 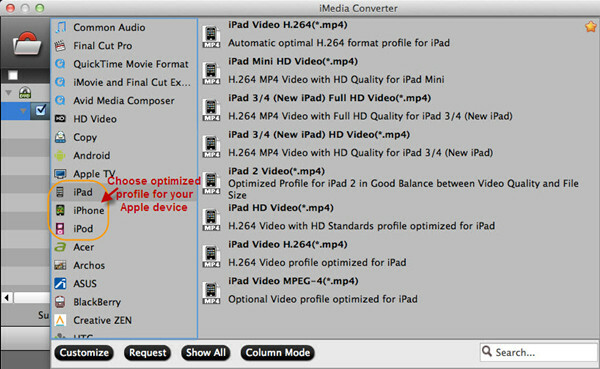 Double check your adjustments and click “Convert” icon to start MKV/M2TS/AVI/WMV to iPad/iPhone/iPod Touch 5 conversion. 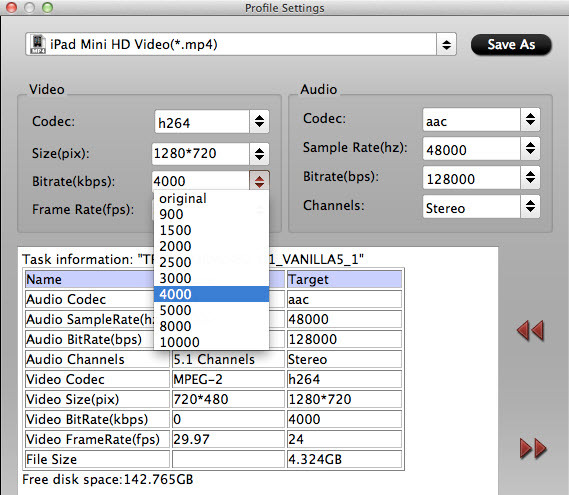 When it is complete, click “Open” button and locate the created MP4 video. You are ready to transfer MKV/M2TS/AVI/WMV videos to MP4 for iPad/iPhone/iPod Touch 5 via iTunes. 1. Connect your Apple device to Mac computer with a USB cable. 2. Open iTunes 11, and it would automatically detect your Apple device. 3. From the File menu, choose Add to Library to add videos and movies to your iPad/iPhone/iPod Touch. For more detailed steps, you should refer to How to transfer/sync movies from iTunes 11 to iPad/iPhone/iPod.